Shaping a new board on the bandsaw. At The Rogue Artisans we believe art isn’t just for museums - it should be part of your everyday life. That’s why we make all our artwork with both beauty and function in mind. 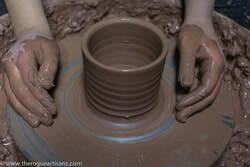 Our pottery is hand thrown from durable stoneware clay, and fired to over 2100’F. Our functional pottery is meant to be used, so it is all dishwasher and microwave safe for your convenience. Check out the video at the bottom of the page to see how we make our unique marbled ceramics! The wood for our boards is selected from a local lumber yard that salvages boards from fallen or damaged trees. This means no new trees are cut to create our products. 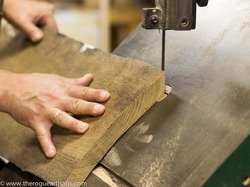 Each board is carefully hand-cut to accentuate it’s natural grain, and then hand-polished with food grade mineral oil. The handmade process adds character to every piece, each one is unique and we hope one will become a valued part of your life. Please contact us with any questions or suggestions, we’d love to hear from you! Check out our Etsy Store and see our Blog for recipe ideas and gardening tips, and get connected with our Facebook and Pinterest pages. Check out this video to see how we make our marbled ceramic bowls! Raw wood ready to be shaped into cutting and serving boards. A newly thrown mug on the wheel. The stripes will appear after trimming. Finished cutting boards in the wood shop ready to ship. Drying bowls almost ready to fire.